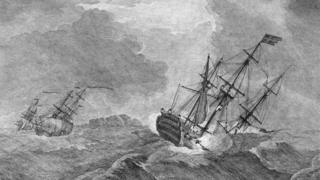 The lead ship HMS Victory sank 100m to the seabed 50 miles (80km) south of Plymouth, taking with it 1,100 men and - so rumour had it - lots of Portuguese gold. The wreckage lay undisturbed until it was located by a marine salvage company in 2009. Beyond the rumoured gold, there was something else on board which was arguably much more economically significant. Also lost that day was the first known attempt to develop an idea that is now used to guide everything from submarines to satellites, from rovers on Mars to the phone in your pocket. When the Victory went down, it took with it John Serson's "whirling speculum", forerunner to the gyroscope. 50 Things That Made the Modern Economy highlights the inventions, ideas and innovations that helped create the economic world. It is broadcast on the BBC World Service. You can find more information about the programme's sources and listen to all the episodes online or subscribe to the programme podcast. Serson was a sea captain, and barely literate. But he was also an "ingenious mechanick", as The Gentleman's Magazine later put it. He was trying to solve a serious problem. Sailors worked out a ship's position by using a quadrant to take an angle from the sun to the horizon, but you could not always see the horizon, because of haze or mist. Inspired by a child's spinning top toy, Serson wondered if he could create an artificial horizon - something that would stay level, even as a ship lurched and swayed around it. As The Gentleman's Magazine recounts, he "got a kind of top made, whose upper surface perpendicular to the axe was a circular plane of polish'd metal; and found, as he had expected, that when this top was briskly set in motion, its plane surface would soon become horizontal. If the whirling plane were disturbed from its horizontal position, it would soon recover it again". After impressing two high-ranking naval officers and an eminent mathematician, Serson was asked to make further observations… aboard the HMS Victory: "and so perish'd poor Mr Serson". His widow, Sarah Serson, was left penniless and asked the Navy for copies of his documents so she could try to make money from the speculum, although there seems to be no evidence that she succeeded. However, a century later, French physicist Leon Foucault would produce a successful prototype based on the same principle which had fascinated Serson. Foucault called his device a "gyroscope", from the Greek words for "turn" and "observe", because he used it to study the Earth's rotation. It was a spinning disc mounted in gimbals, a set of pivoted supports that allow the disc to maintain its orientation regardless of how the base might be tilting around. Then electric motors came along, meaning the disc could spin indefinitely. And practical applications came thick and fast. Ships got workable artificial horizons and so did aeroplanes. In the early 1900s, two inventors figured out how to align the spin to the Earth's north-south axis, giving us the gyrocompass. Image caption The gyrocompass was widely hailed as a modern wonder, shown here on a cigarette card. Combine these instruments with others - accelerometers, magnetometers - and you get a good idea of which way up you are and in which direction you are heading. Feed these outputs into systems that can course-correct, and you have an aeroplane's autopilot, a ship's gyro-stabilizer, and navigation systems on spacecraft or missiles. Add in GPS, and you know where you are. There is a limit to how small you can make spinning discs in gimbals, but other technological developments have miniaturised the gyroscope. Vibrating micro-electro-mechanical gyroscopes measure only a few cubic millimetres. Researchers are making a laser-based gyroscope thinner than a human hair. As these and other sensors have got smaller and cheaper - and computers faster, and batteries lighter - they have found uses from smartphones to robots, gaming consoles and virtual reality headsets. And another technology around which there is a particular buzz: the drone. The first pilotless flight is often traced to 1849 - only three years before Foucault's gyroscope. Austria tried to attack Venice by fixing bombs to balloons and waiting for the wind to blow in the right direction. It was not a triumph: some bombs landed in Austrian territory. But military uses continued to drive drone technology. If you searched for "drones" in a news archive, until about four or five years ago, you would find that the top stories were about war. Then suddenly they started being about "what do airspace regulations mean for hobbyists? ", and "how long before drones are delivering our groceries?". That is a big question. Drones are now commonplace from surveying to moviemaking; they get urgent medical supplies to hard-to-reach places. But it is the routine, everyday uses that promise to be truly transformative: flying our online shopping to us, or even flying us - the Chinese company Ehang is pioneering drones that can carry human passengers. In rural China, delivery drones are starting to look like a leapfrog technology: one that catches on most quickly where there is not a competing established infrastructure - in this case, of big-box retail stores and roads for van deliveries. Zhangwei, for example, is a village in Jiangsu province where few people own cars, and only half have fridges, but everyone has a phone - and they use those mobiles to place orders at online retailer JD.com for everything from disposable nappies to fresh crabs. As Jiayang Fan describes in the New Yorker, about four times a day, warehouse workers dispatch the village's orders on a drone that carries up to 30lb at 45 miles per hour. Everyone is happy - except for Big Auntie, the woman who runs the village shop. If drones are to take off more widely, we will need better solutions to the so-called "last mile" problem. In Zhangwei, JD.com employs a human to distribute the crabs and the nappies to the villagers who ordered them - but in countries where labour is pricier, the last miles are where delivery costs are concentrated; automate it, and some believe bricks-and-mortar stores could cease to exist altogether. But nobody is sure precisely how that might work. Do we want our online purchases parachuted into our back gardens, or plunked on the roofs of our apartment buildings? How about smart windows that can open to let in drones when we are not at home? Are more stringent no-fly zones needed to avoid the kind of disruption recently caused at Gatwick and Heathrow when drone sightings delayed hundreds of flights? Then there is another problem - the one that did for poor John Serson: the weather. If we are going to rely on airborne deliveries, they will have to work in all conditions. Will drones ever navigate storms that could sink a battleship? Perhaps then the promise of the gyroscope will have truly been fulfilled. The author writes the Financial Times's Undercover Economist column. 50 Things That Made the Modern Economy is broadcast on the BBC World Service. You can find more information about the programme's sources and listen to all the episodes online or subscribe to the programme podcast.